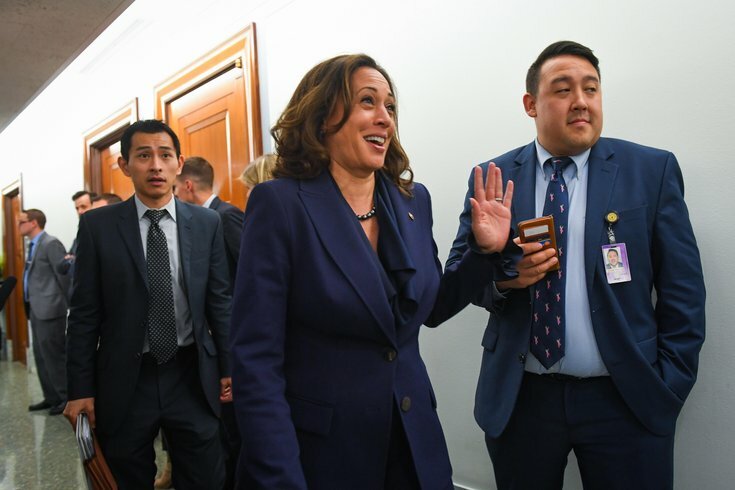 Senator Kamala Harris reacts as she departs the Senate Judiciary Committee room following last minute maneuvering on the vote on Brett Kavanaugh for Associate Justice of the Supreme Court on Sept. 28, 2018 in Washington. California Senator Kamala Harris announced her official run for president on Monday, joining an already-crowded ticket to challenge President Trump in the 2020 election. The 54-year-old Harris, the second black woman to ever serve in the Senate, symbolically declared her campaign on Martin Luther King Jr. Day and was meant to pay homage to women like Shirley Chisholm who ran for president before her. She will hold her first campaign event on Friday in South Carolina. Harris announced her run on "Good Morning America" Monday morning. "Well first of all let me just say, I love my country," she said. "This is a moment in time I feel a sense of responsibility for the best of who we are." So far other notables like Massachusetts Senator Elizabeth Warren and Julián Castro have also officially announced their bids. Closer to home, New Jersey Senator Cory Booker has yet to publicly announce whether or not he will run. Harris, a former California attorney general and San Francisco district attorney, has ties to the pragmatic and leftist ends of the democratic party and has recently adopted a more progressive agenda since being elected to Congress, according to the New York Times.